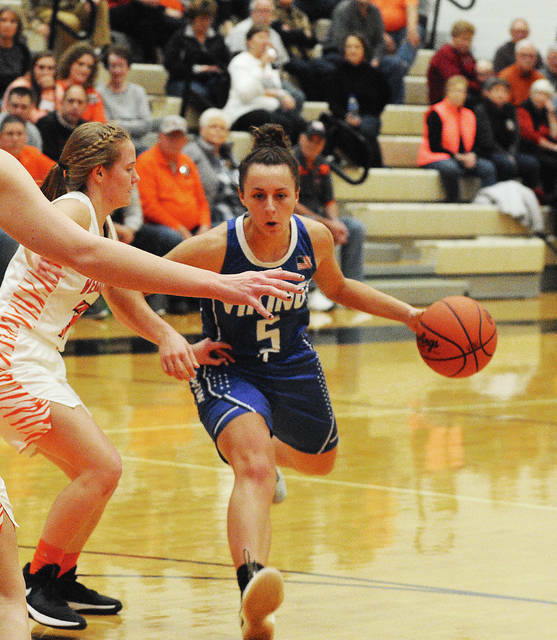 Rob Kiser|Call Photo Versailles’ Liz Ording makes an off-balance pass as Miami East’s Whitley Gross defends. 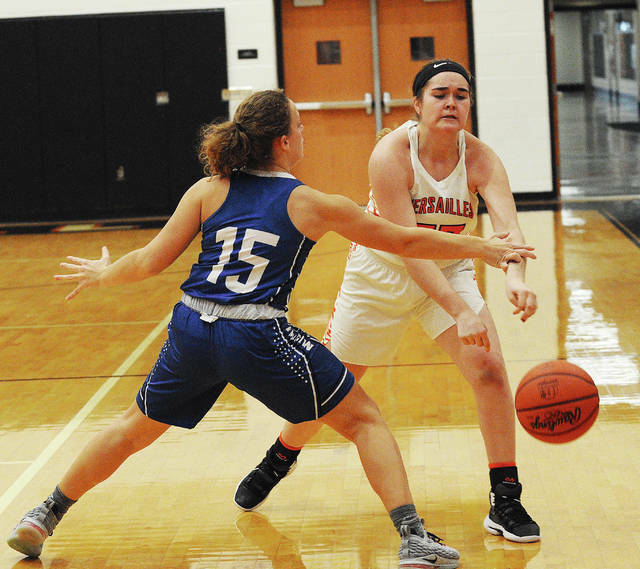 Rob Kiser|Call Photo Miami East’s Maria Staton is pressured by Versailles’ Liz Ording Saturday. 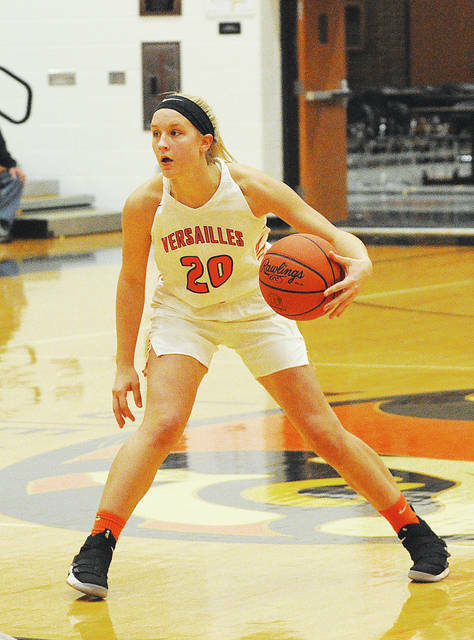 Rob Kiser|Call Photo Versailles’ Kelsey Custenborder drives towards the basket Saturday. 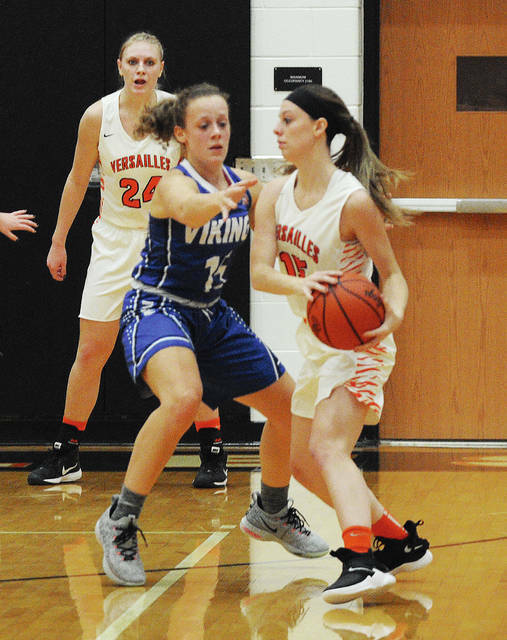 Rob Kiser|Call Photo Versailles’ Lindsey Winner looks to pass the ball around Miami East’s Whitley Gross Saturday. 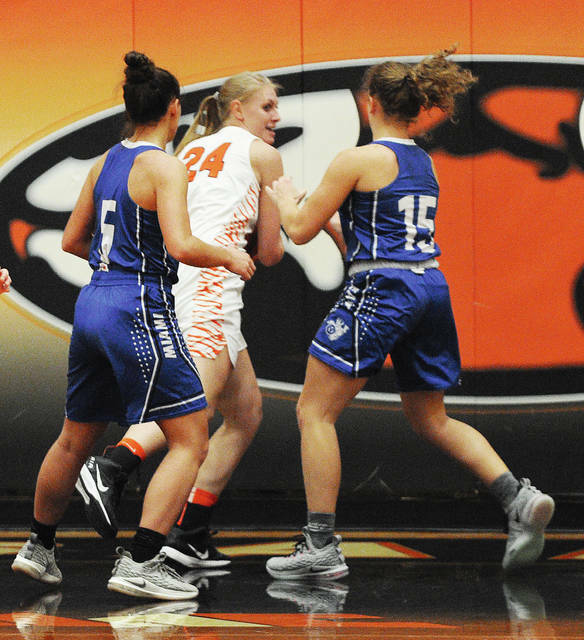 VERSAILLES — The Versailles girls basketball team survived another close call. But, Miami East didn’t make it easy. And not til Morgan Haney’s jumper bounced off the rim in the closing seconds could Versailles fans breather a sigh of relief. Caitlin McEldowney added two late free throws to give the Tigers a 38-34 win. Versailles, whose first two wins came in overtime, improved to 6-0, while Miami East dropped to 4-2. McEldowney made six straight free throws in the final minute and Hannah Barga added two more. 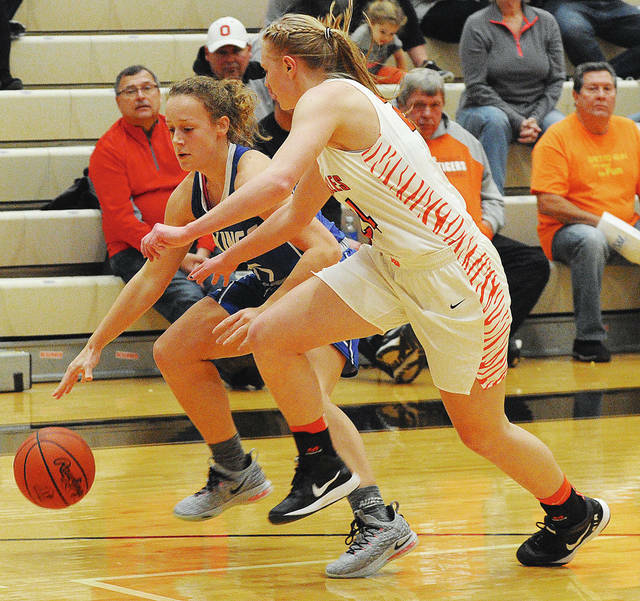 It allowed the Tigers to overcome making just two field goals in the second half — the last a 3-pointer by McEldowney late in the third quarter. And that last two minutes were a lot more exciting than it appeared they would be. Versailles led 25-14 at halftime and was still up 30-21 going to the fourth quarter. But, Miami East’s 3-2 zone did not allow a field goal in the final quarter. 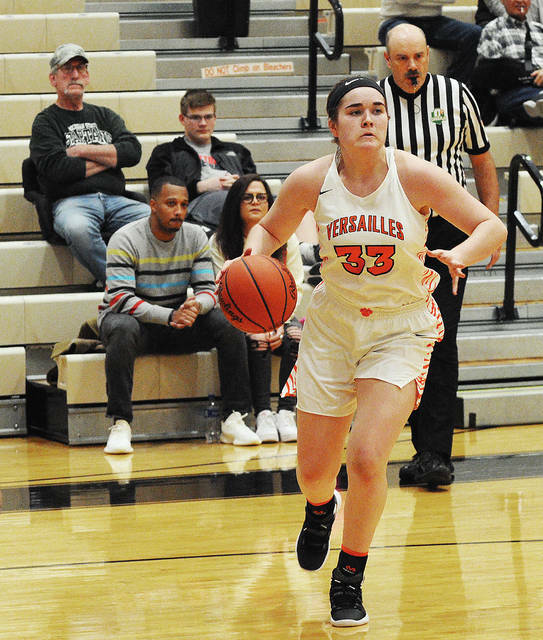 Miller, who scored 10 of her 11 points in the final eight minutes, hit two free throws with 5:13 remaining and Hunley followed with a three to make it 30-26 with 4:36 remaining. With Miami East only having one team foul, Versailles elected to pull the ball out. “At some point, with the lead we had, we just decided to take care of the ball,” Stonebraker said. 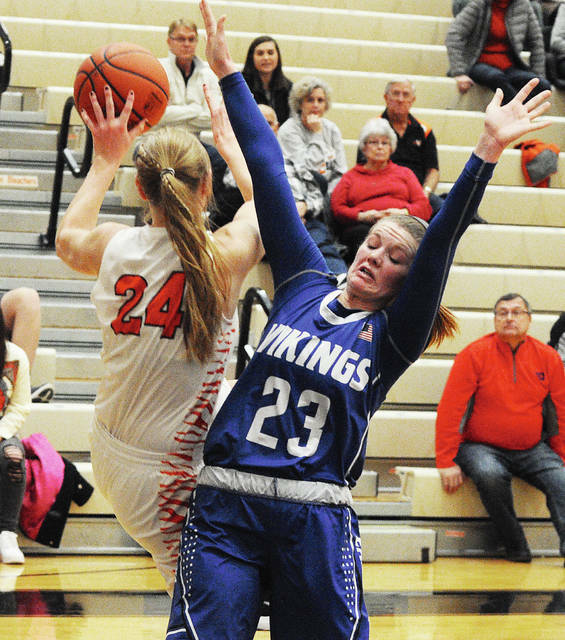 But, after four Miami East fouls, Versailles was called for over-and-back. Miami East couldn’t convert and had to send Barga to the line. The junior guard calmly sank both free throws to make it 32-26. Miller answered with a long three at the other end to make it 32-29 with 43 seconds to go. McEldowney was fouled on the inbounds and hit both free throws to put the Tigers up 34-29. Then, Miller hit an amazing off-balance three from NBA range to get East within 34-32 with 31.4 seconds to go. 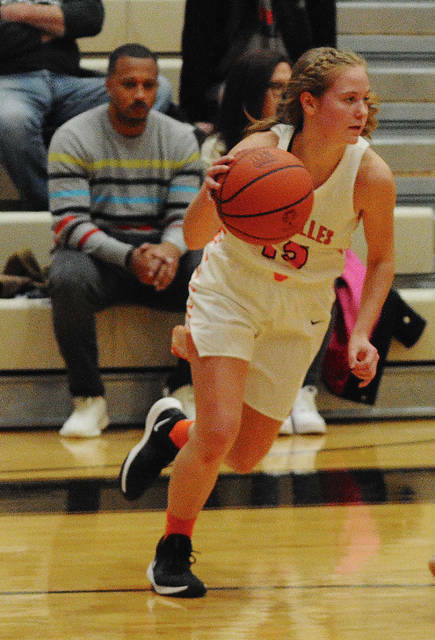 “Camryn (Miller) hit a couple threes from way downtown,” Stonebraker said. McEldowney was fouled again with 25 seconds to go and was perfect again to make it 36-32. Miller was fouled shooting a three and converted two of the free throws to make it 36-34 with 17.3 seconds left. 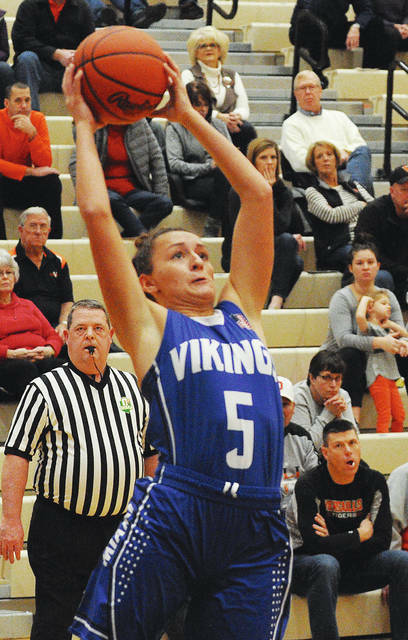 After Versailles missed two free throws, Miami East had a chance for the tie. With a foul to give, Versailles fouled with 7.5 seconds to go forcing East to inbound again. Haney got a good look, but the shot was just off the mark. “Morgan (Haney) had a really nice game today,” Stonebraker said. And Vanover had no complaints about the shot. The first half, Haney had 11 of East’s 14 points and hit a three early in the second quarter to tie it 12-12. But, Versailles finished the half on a 13-2 run. During an 11-0 run, Danielle Kunk had five points, including a 3-point play. Liz Ording had a basket and Brooke Stonebraker had four points inside. 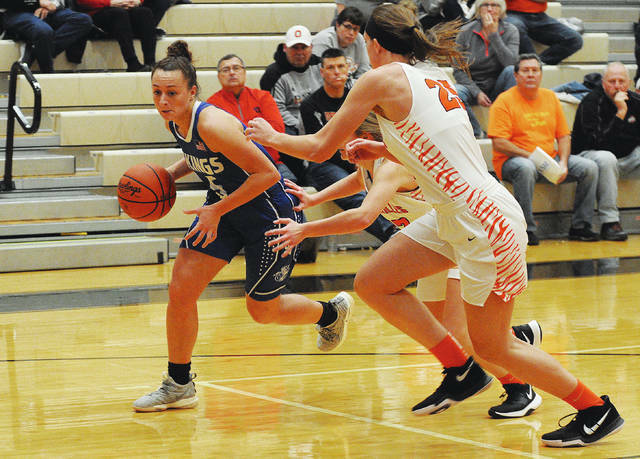 After Haney stopped the run with a basket, Lindsey Winner scored the final two points of the half to make it 25-14 and set up the Miami East comeback. But, the second half was a different story. McEldowney was the lone Tiger in double figures with 12 points. Haney had a game-high 15 for East and Miller added 11. 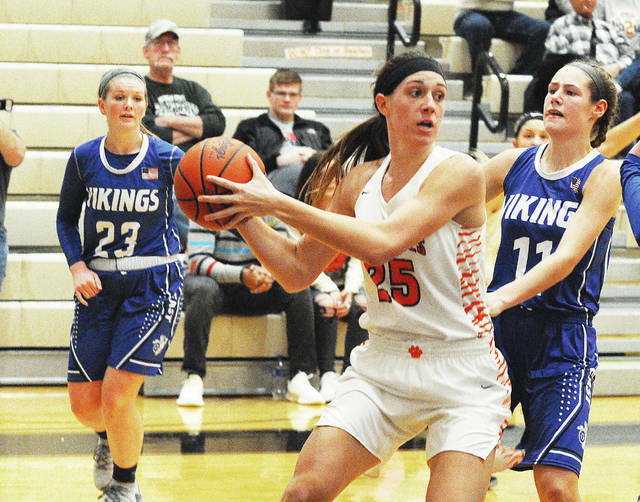 Versailles will be back in MAC action Thursday at Marion Local and Miami East will play at Twin Valley South Thursday in CCC action. After a game that had both teams fans on the edge of their seats. Morgan Haney 6-2-15, Rori Hunley 2-0-6, Camryn Miller 2-5-11, Maria Staton 1-0-2, Whitley Gross 0-0-0, Emily Adkins 0-0-0, Cadence Gross 0-0-0. Totals: 11-7-34. Caitlin McEldowney 2-6-12, Danielle Kunk 2-1-5, Liz Ording 2-0-4, Lindsey Winner 2-0-4, Kelsey Custenborder 2-0-5, Hannah Barga 0-2-2, Savannah Toner 0-2-2, Liz Watren 0-0-0, Brooke Stonebraker 2-0-4. Totals: 12-11-38. 3-point field goals — Miami East: Haney, Hunley (2), Miller (2). Versailles: McEldowney (2), Custenborder. Records: Versailles 6-0, Miami East 4-2. 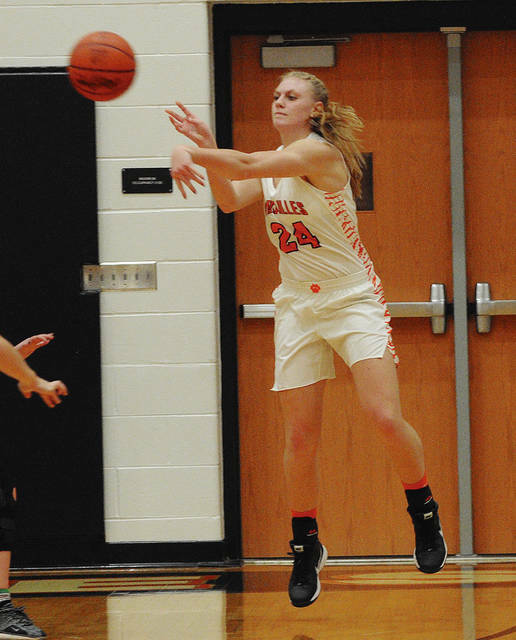 Reserve score: Versailles 42, Miami East 29.
https://www.dailycall.com/wp-content/uploads/sites/30/2018/12/web1_whitleygross-1.jpgRob Kiser|Call Photo Versailles’ Liz Ording makes an off-balance pass as Miami East’s Whitley Gross defends. 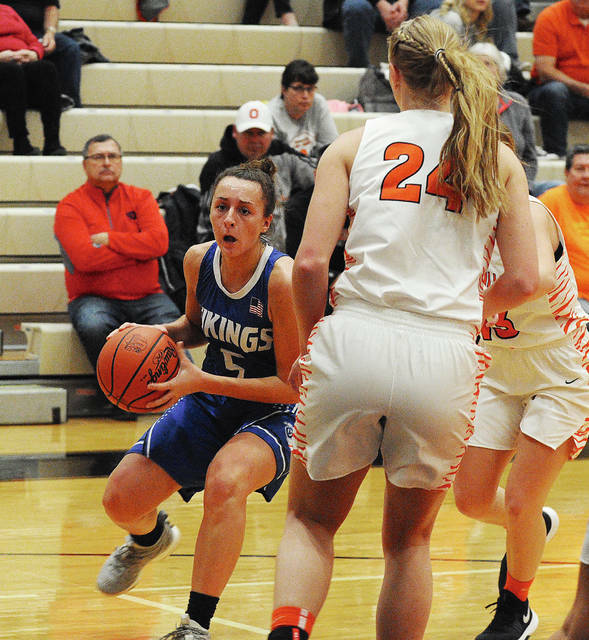 https://www.dailycall.com/wp-content/uploads/sites/30/2018/12/web1_mariastaton-1.jpgRob Kiser|Call Photo Miami East’s Maria Staton is pressured by Versailles’ Liz Ording Saturday. 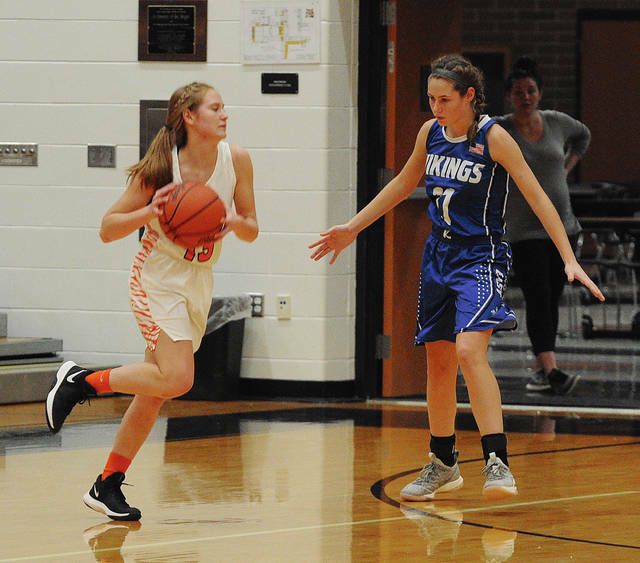 https://www.dailycall.com/wp-content/uploads/sites/30/2018/12/web1_kelsey2-3.jpgRob Kiser|Call Photo Versailles’ Kelsey Custenborder drives towards the basket Saturday. 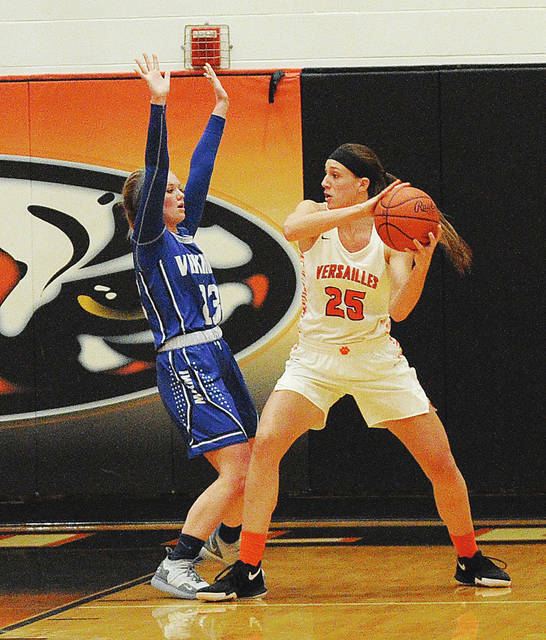 https://www.dailycall.com/wp-content/uploads/sites/30/2018/12/web1_lindsey-1.jpgRob Kiser|Call Photo Versailles’ Lindsey Winner looks to pass the ball around Miami East’s Whitley Gross Saturday.